Brookfield Renewable owns, develops and operates one of the world’s largest renewable power portfolios, which includes more than 250 renewable power facilities in North America, Latin America and Europe; with a combined installed capacity exceeding 10,000 megawatts. Brookfield Renewable creates value for its customers and global communities by developing unique, natural power solutions that accelerate the world’s evolution towards a carbon-free future. A great example of this is our Kokish Project in British Columbia. 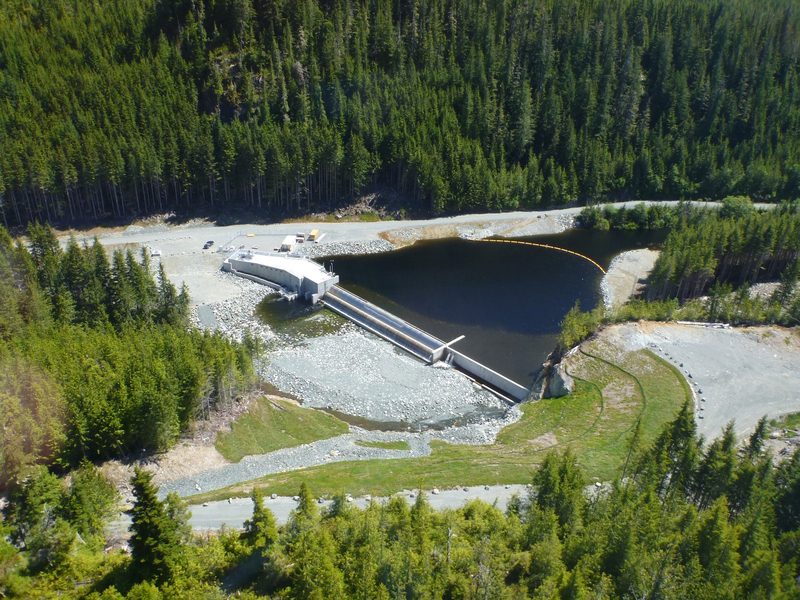 Located on northeastern Vancouver Island, and commissioned in 2014, Kokish is a run-of-river hydroelectric facility that generates 45 MW of capacity, owned by Brookfield Renewable and the ‘Namgis First Nation. Not only a model of sustainable development, it is also a great example of how an indigenous community and the private sector can come together to create a project that benefits the local community and contributes to a renewable energy future. The Kokish River is home to coho, chinook, chum, pink, and sockeye salmon, as well as to cutthroat, steelhead and rainbow trout. To ensure that fish can continue to migrate and to minimize the impact on the environment, the design of the facility included a fish ladder, which allows fish to swim upstream, and an elaborate coanda screen intake arrangement to prevent fish from entering the intake box. "This project has undone some of the historic industrial damage. We are confident that it will continue to improve the Kokish River watershed, while allowing ‘Namgis to share in benefits generated from within our territory. We are grateful to have found in Brookfield a partner who will help us achieve this." Through this unique and truly cooperative equity partnership, the ‘Namgis were directly involved every step of the way, from project inception to permitting, environmental assessments, construction and operations. 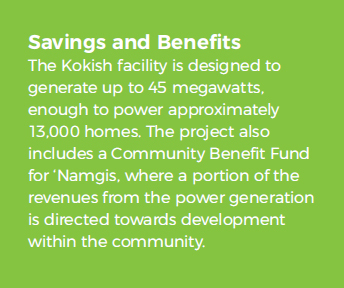 The ‘Namgis community were clear all along in their direction to their representatives and to Brookfield Renewable; the Kokish project had to be developed and operated in a way that prevented harm to the environment, or they would not support it. By all accounts, this requirement has been fully satisfied. 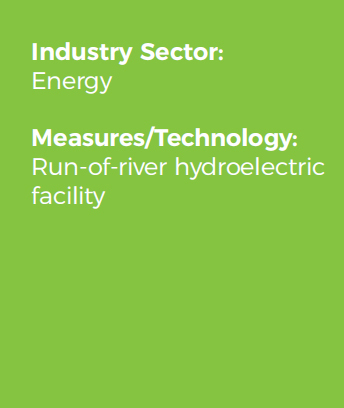 The hydro facility produces clean energy while providing economic diversification and growth in the community through jobs and spending on goods and services; while safeguarding North Vancouver Island’s ecosystem. 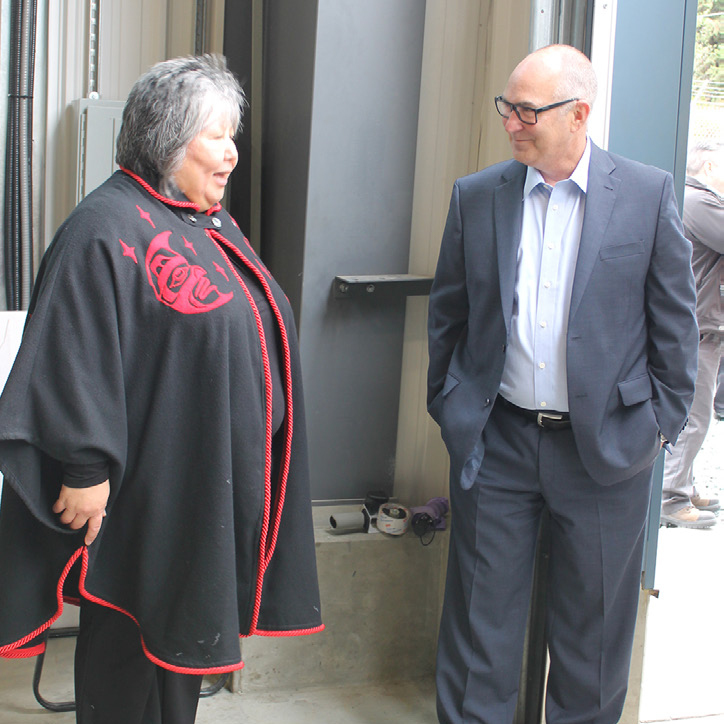 Kokish was the first First Nation project to have benefited from the P3 Canada Fund. P3, which stands for “public-private partnership,” is a federal program designed to provide economic stimulation through the financing of private infrastructure projects. In this case, the program was intended to help the ‘Namgis First Nation build equity through a hydropower project located within its core territory.